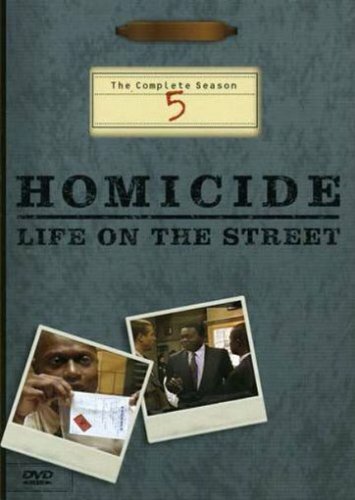 Homicide: Life on the Street - Season Five - BUY THIS DVD! HOMICIDE: LIFE ON THE STREET is one of the most popular, innovative, and critically acclaimed police shows in television history. Based on the award-winning book by David Simon and adapted for television by Barry Levinson (RAIN MAN, DINER) and Tom Fontana (St. Elsewhere, Oz), the series stars Richard Belzer, Yaphet Kotto, Andre Braugher, and Ned Beatty as a team of homicide detectives solving cases on the gritty streets of Baltimore. The series is revered by fans and critics alike for eschewing typical crime drama violence in favor of gripping storylines, strong writing, compelling characters, and a superb ensemble cast. This release presents season 5 of the show in its entirety. HOW TO WIN? SIMPLE. SEND IN YOUR NAME AND ADDRESS TO contests@efilmcritic.com. Put "HOMICIDE 5" in the subject line and cross your fingers. There will be [b]3 lucky winners of the DVD. We will draw names it could be yours. Only 1 entry per household.